4 Star hotel in Venice. The Hotel Giorgione is located in the Cannaregio district, the heart of the real Venice, within 5 minutes walking distance from the Rialto Bridge (many shops) and 10 minutes from Piazza San Marco (Palazzo Ducale, Basilica, St. Mark’s Basin…). The Giorgione is a boutique hotel which has a courtyard with a fountain where it’s so nice to take breakfast in summer and reveals all its romantic atmosphere in the evening. 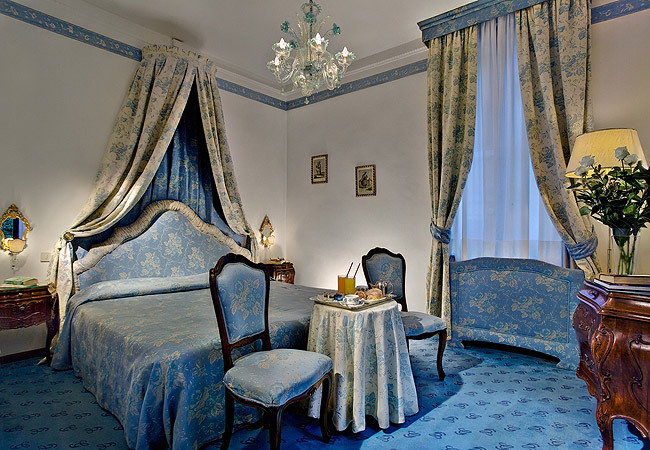 In this historic residence you will find inviting spaces, comfortable and beautifully decorated (antique furniture, Murano glass chandeliers) that are also present in the hotel rooms (some of them have a private terrace overlooking the rooftops of Venice). The restaurant of the Giorgione offers a cuisine that honors the Venetian culinary tradition complimented by an excellent wine selection.